The following overview is excerpted from: Ketcham, R.A. (2005b) Three-dimensional grain fabric measurements using high-resolution X-ray computed tomography. Journal of Structural Geology, 27, 1217-1228 and Ketcham, R.A., and Ryan, T. (2004) Quantification and visualization of anisotropy in trabecular bone. Journal of Microscopy, 213, 158-171. Quant3D is a versatile program that can be used to analyze fabrics in any three-dimensional data set; examples include quantification of anisotropy in trabecular bone (Ketcham and Ryan, 2004; Ryan and Ketcham, 2005) and textural analysis of metamorphic rocks (Ketcham, 2005b). Fabric tensors are produced based on the star volume distribution (SVD), star length distribution (SLD), and mean intercept length (MIL) methods. Principal component directions and magnitudes are provided by the tensors, providing the degree of anisotropy and shape indices of the phase of interest. Three-dimensional rose diagrams are a unique feature implemented in Quant3D for analyzing non-orthogonal directional fabric components; they are VRML-format graphics files that can be rotated and viewed interactively. Click here to download Quant3D via Box. Example of fabric analysis of quartzofeldspathic layers using Quant3D. In (a) the scan data are first segmented to isolate the material of interest, in this case garnet (white), biotite + kyanite (gray), and quartz + feldspar (black). ‘Star’ analyses proceed by placing a series of points within the material of interest, and measuring the distance from each point to the material boundary in many directions (red lines). Only two dimensions shown here, but measurements are actually made in 3D. The analysis directions are uniformly distributed in three dimensions on a grid defined by the line intersections on the sphere shown in (b). 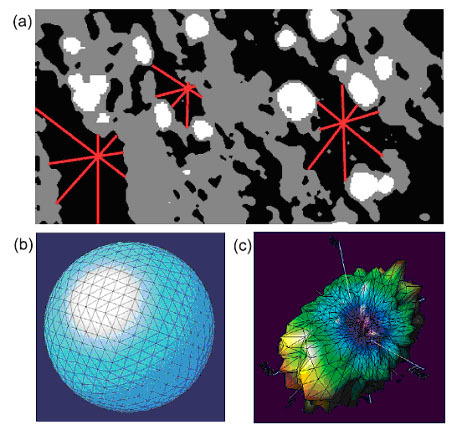 To create a 3D rose diagram, each intersection in (b) is projected from the origin by its relative star volume component value (c). Colors are assigned based on SVD/Max(SVD), and color coding from 0 (violet) to 1 (red) (from Ketcham, 2005b). 3D rose diagrams showing relative SVD component magnitudes for quartz + plagioclase (upper row) and garnet (lower row) in sample MD generated in Quant3D. First diagram in each row (a,d) is viewed down the ‘Up’ axis; second diagram (b,c) is viewed along the second eigenvector, and third (c,f) is an arbitrary orientation. The diagrams are stored in VRML 97 format, and can be viewed interactively with a number of software applications and browser plug-ins (from Ketcham, 2005b). Acquaah, F., Brown, K.A.R., Ahmed, F., Jeffery, N., and Abel, R.L. (2015) Early trabecular development in human vertebrae: overproduction, constructive regression, and refinement. Frontiers in Endocrinology, 6, 67. Alanazi, N., and Kassem, E. (2018) Evaluation of the anisotropy of asphalt mixtures. Journal of Transportation Engineering, Part B: Pavements, 144, 04018022. Arouca, A. M., Lucena, M. A. M., Rossiter, R. J., Talhavini, M., & Weber, I. T. (2017) Use of luminescent gunshot residues markers in forensic context− Part II. Forensic Science International. Barak, M. M., Lieberman, D. E., & Hublin, J. J. (2013) Of mice, rats and men: trabecular bone architecture in mammals scales to body mass with negative allometry. Journal of structural biology, 183, 123-131. Bayati, M. R., Molaei, R., Budai, J. D., Narayan, R. J., & Narayan, J. (2013) Role of substrate crystallographic characteristics on structure and properties of rutile TiO2 epilayers. Journal of Applied Physics, 114, 044314. Bernasconi, A., & Cosmi, F. (2009) Fibre Orientation at Notches and Fatigue Behaviour of Short Fibre Reinforced Polyamide. ICCM. Bernasconi, A., and Cosmi, F. (2008) Analisi sperimentale dell’anisotropia in prossimità di intagli in materie plastiche rinforzate con fibre corte. XXXVII Convegno Nazionale, Università di Roma, Italy, 10 p.
Bernasconi, A., and Cosmi, F. (2011) Analysis of the dependence of the tensile behavior of a short fibre reinforced polyamide upon fibre volume fraction, length and orientation. Procedia Engineering, 10, 2129-2134. Bernasconi, A., Cosmi, F., and Dreossi, D. (2008) Local anisotropy analysis of injection moulded fibre reinforced polymer composites. Composites Science and Technology, 68, 2574-2581. Bernasconi, A., Cosmi, F., and Dreossi, D. (2008) Analisi dell’anisotropia microstrutturale in materiali compositi rinforzati con fibre corte. Frattura ed Integrità Strutturale, 3, 18-29. Bernasconi, A., Cosmi, F., & Hine, P. J. (2012) Analysis of fibre orientation distribution in short fibre reinforced polymers: A comparison between optical and tomographic methods. Composites Science and Technology, 72, 2002-2008. Bernasconi, A., Broznic, M., Cosmi, F., Dreossi, D., and Tromba, G. (2007) Resistenza e anisotropia in compositi rinforzati con fibre corte: analisi mediante tomografia con luce di sincrotrone. Atti del Congresso IGF 19, Milan, Italy, 8 p.
Bernasconi, A., Cosmi, F., and Zappa, E. (2010) Combined effect of notches and fibre orientation on fatigue behavior of short fiber reinforced polyamide. Strain, 46, 435-445. Bhasin, A., Izadi, A., and Bedgaker, S. (2010) Three dimensional distribution of the mastic in asphalt composites. Construction and Building Materials, 25, 4079-4087. Bishop, P. J., Clemente, C. J., Hocknull, S. A., Barrett, R. S., & Lloyd, D. G. (2017) The effects of cracks on the quantification of the cancellous bone fabric tensor in fossil and archaeological specimens: a simulation study. Journal of anatomy, 230, 461-470. Bishop, P.J., Walmsley, C.W., Phillips, M.J., Quayle, M.R., Boisvert, C.A., and McHenry, C.R. (2015) Oldest Pathology in a Tetrapod Bone Illuminates the Origin of Terrestrial Vertebrates. PloS one, 10:5. Brown, K. R., & Abel, R. Micro-CT in forensic anthropology: Implications for estimating age-at-death in infants, recent and ancient. Brun, F., Mancini, L., Kasae, P., Favretto, S., Dreossi, D., & Tromba, G. (2010). Pore3D: A software library for quantitative analysis of porous media. Nuclear Instruments and Methods in Physics Research Section A: Accelerators, Spectrometers, Detectors and Associated Equipment, 615, 326-332. Bubeck, A., Walker, R. J., Healy, D., Dobbs, M., & Holwell, D. A. (2017) Pore geometry as a control on rock strength. Earth and Planetary Science Letters, 457, 38-48. Chatzaras, V., Kruckenberg, S.C., Cohen, S.M., Medaris, L.G., Withers, A.C., and Bagley, B. (2016) Axial-type olivine crystallographic preferred orientations: The effect of strain geometry on mantle texture. Journal of Geophysical Research: Solid Earth, 121, 4895-4922. Chirchir, H., Zeininger, A., Nakatsukasa, M., Ketcham, R. A., & Richmond, B. G. (2016) Does trabecular bone structure within the metacarpal heads of primates vary with hand posture?. Comptes Rendus Palevol, 16, 533-544. Coiner-Collier, S. F. (2015) Feeding ecology and the trabecular structure of the mandibular condyle in extant primates (Doctoral dissertation, Rutgers University-Graduate School-New Brunswick. Coiner-Collier, S., Vogel, E.R., and Scott, R.S. (2018) Trabecular anisotropy in the primate mandibular condyle is associated with dietary toughness. The Anatomical Record, 301, 1342-1359. Cosmi, F. (2011) Local anisotropy and elastic properties in a short glass fibre reinforced polymer composite. Strain, 47, 215-221. Cosmi, F. (2009) Morphology-based prediction of elastic properties of trabecular bone samples. Acta of Bioengineering and Biomechanics, 11, 3-9. Cosmi, F., and Bernasconi, A. (2010) Elasticity of short fibre reinforced polyamide: morphological and numerical analysis of fibre orientation effects. Materials Engineering, 17, 6-10. Cosmi, F., & Bernasconi, A. (2010) Fatigue behaviour of short fibre reinforced polyamide: morphological and numerical analysis of fibre orientation effects. Giornata IGF Forni di Sopra (UD) 2010. Cosmi, F., & Biasi, G. (2011) A preliminary study on sclerofoam morphology. Étude préliminaire de la morphologie des mousses sclérosantes. Phlébologie, 64, 3. Cosmi, F., and Ravalico, C. (2015) Threshold identification for micro-tomographic damage characterisation in a short-fibre-reinforced polymer. Strain, 51, 171-179. Cosmi, F., Scozzese, S., & Biasi, G. A Morphology Study on Sclerofoams. Cosmi, F., Scozzese, S., and Bernasconi, A. (2010) Studio del danneggiamento mediante tomografia in luce del sincrotrone: impatto di un cono d’ombra sulla qualitá finale delle ricostruzioni. Frattura ed Integritá Strutturale, 13, 17-23. Cosmi, F., Steimberg, N., Dreossi, D., & Mazzoleni, G. (2009) Structural analysis of rat bone explants kept in vitro in simulated microgravity conditions. Journal of the mechanical behavior of biomedical materials, 2, 164-172. Cosmi, F., Steimberg, N., & Mazzoleni, G. (2015) A mesoscale study of the degradation of bone structural properties in modeled microgravity conditions. Journal of the mechanical behavior of biomedical materials, 44, 61-70. Cosmi, F., Bernasconi, A., and Sodini, N. (2011) Phase contrast micro-tomography and morphological analysis of a chort carbon fibre reinforced polyamide. Composites Science and Technology, 71, 23-30. Cosmi, F., Steimberg, N., and Mazzoleni, G. (2015) A mesoscale study of the degradation of bone stuctural properties in modeled microgravity conditions. Journal of the Mechanical Behavior of Biomedical Materials, 44, 61-70. Cotter, M.M., Loomis, D.A., Simpson, S.W., Latimer, B., and Hernandez, C.J. (2011) Human evolution and osteoporosis-related spinal fractures. PLoS ONE, 6, e26658. Dal Ferro, N., Delmas, P., Duwig, C., Simonetti, G., and Morari, F. (2012) Coupling X-ray microtomography and mercury intrusion porosimetry to quantify aggregate structures of a cambisol under different fertilisation treatments. Soil and Tillage Research, 119, 13-21. Du Plessis, A., Broeckhoven, C., Guelpa, A., & Le Roux, S. G. (2017) Laboratory X-ray micro-computed tomography: a user guideline for biological samples. GigaScience, 6, 1-11. Dyess, J. E., Hansen, V. L., Goscinak, C. (2015) Constrains on vorticity and non-coaxial shear direction in Neoarchean L-S tectonites, an example from northern Minnesota, USA. Precambrian Research, 256, 189-200. Elmabrouk, B., & Berger, J. R. (2013) Boundary element analysis for effective stiffness tensors: effect of fabric tensor determination method. Computational Mechanics, 1-8. Fajardo, R. J., Desilva, J. M., Manoharan, R. K., Schmitz, J. E., Maclatchy, L. M., & Bouxsein, M. L. (2013) Lumbar Vertebral Body Bone Microstructural Scaling in Small to Medium‐Sized Strepsirhines. The Anatomical Record, 296, 210-226. Fu, Y., Xie, H., Deng, B., Du, G., Chen, R., Xiao, T. (2014) Three-dimensional structure of polystyrene colloidal crystal by synchrotron radiation X-ray phase-contrast computed tomography. Materials Science & Processing, 115, 781-790. Geer, S. R. (2014) Discrete element and homogenization based approaches for determining the mechanical properties of geomaterials. Colorado School of Mines. Gosman, J.H., and Ketcham, R.A. (2009) Patterns in ontogeny of human trabecular bone from SunWatch Village in the prehistoric Ohio Valley: general features of microarchitectural change. American Journal of Physical Anthropology, 138, 318-332. Griffin, N.L. (2008) Bone architecture of the hominin second proximal pedal phalanx: a preliminary investigation. Journal of Human Evolution, 54, 162-168. Griffin, N.L., D’Août, K., Ryan, T.M., Richmond, B.G., Ketcham, R.A., Postnov, A. (2010) Comparative forefoot trabecular bone architecture in extant hominids. Journal of Human Evolution, 59, 202-213. Gutzwiller, S. C., Su, A., & O’Connor, P. M. (2013) Postcranial pneumaticity and bone structure in two clades of neognath birds. The Anatomical Record, 296, 867-876. Heij, G., Elmore, D., Roberts, J., Steullet, A. K., Dulin, S., & Friedman, S. (2015) Anisotropy of Magnetic Susceptibility: A Petrofabric Tool to Measure the Fabric of Shales. 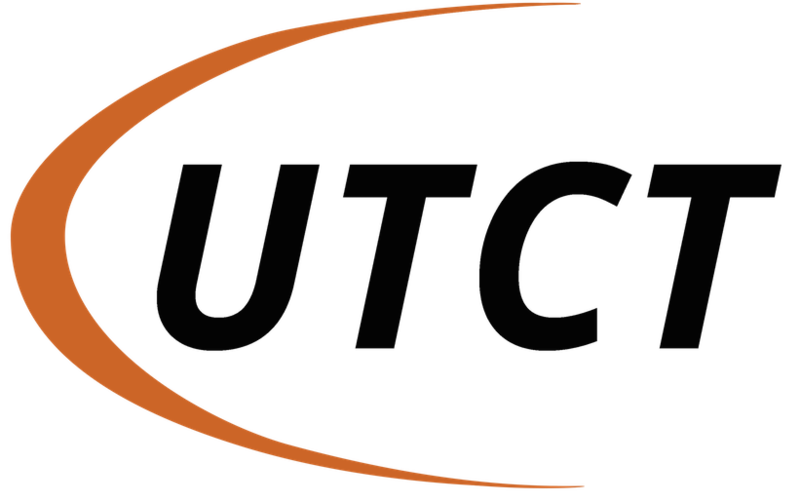 Unconventional Resources Technology Conference. Hébert, D., Lebrun, R., & Marivaux, L. (2012) Comparative Three‐Dimensional Structure of the Trabecular Bone in the Talus of Primates and Its Relationship to Ankle Joint Loads Generated During Locomotion. The Anatomical Record, 295, 2069-2088. Hill, C.A. (2011) Ontogenetic change in temporal bone pneumatization in humans. The Anatomical Record, 294, 1103-1115. Hill, C. A. (2008) Evolutionary and developmental history of temporal bone pneumatization in hominids. The Pennsylvania State University. Hill, C. A. (2010) Functional implications of temporal bone pneumatization in hominids. The FASEB Journal, 24, 178-5. Hill, C.A., and Richtsmeier, J.T. (2008) A quantitative method for the evaluation of three-dimensional structure of temporal bone pneumatization. Journal of Human Evolution, 55, 682-690. Kaeffer, B., Trubuil, A., Kervrann, C., Pardini, L., & Cherbut, C. (2002) Three-dimensional binding of epidermal growth factor peptides in colonic tissues produced from rotating bioreactor. In Vitro Cellular & Developmental Biology-Animal, 38, 436-439. Kajbafvala, A., Nachtrab, W., Wong, T., & Schwartz, J. (2014) Bi2Sr2CaCu2O8+ x round wires with Ag/Al oxide dispersion strengthened sheaths: microstructure–properties relationships, enhanced mechanical behavior and reduced Cu depletion. Superconductor Science and Technology, 27, 095001. Ketcham, R. A., & Koeberl, C. (2013) New textural evidence on the origin of carbonado diamond: An example of 3-D petrography using X-ray computed tomography. Geosphere, 9, 1336-1347. Ketcham, R. A. (2005) Three-dimensional grain fabric measurements using high-resolution X-ray computed tomography. Journal of Structural Geology, 27, 1217-1228. Ketcham, R.A. (2005b) Three-dimensional textural measurements using high-resolution X-ray computed tomography. Journal of Structural Geology, 27, 1217-1228. Ketcham, R.A., and Ryan, T. (2004) Quantification and visualization of anisotropy in trabecular bone. Journal of Microscopy, 213, 158-171. Kim, K., & Withey, P. (2017) Formation of an Intermediate Layer Between Grains in Nickel-Based Superalloy Turbine Blades. Metallurgical and Materials Transactions A, 48, 2932-2942. Kim, K., & Withey, P. A. (2017) Microstructural Investigation of the Formation and Development of Topologically Close‐Packed Phases in a 3rd Generation Nickel‐Base Single Crystal, Superalloy. Advanced Engineering Materials. Kim, K., & Withey, P. (2016) Detection of Rhenium-Rich Particles at Grain Boundaries in Nickel-Base Superalloy Turbine Blades. Materials transactions, 57, 1698-1706. Kim, K., Withey, P., & Griffiths, W. D. (2015) Detection of an Intermediate Layer Containing a Rhenium-Rich Particle at Grain Boundaries Formed Within Single Crystal Nickel-Based Superalloys. Metallurgical and Materials Transactions A, 46, 1024-1029. Lin, M. T., Wan, C. H., & Wu, W. (2017) Characterization and corrosion resistance of TiZr coating on SS304 stainless steel using cathodic arc evaporation techniques. Surface and Coatings Technology, 320, 217-225. Lin, M. T., Wan, C. H., & Wu, W. (2013) Comparison of corrosion behaviors between SS304 and Ti substrate coated with (Ti, Zr) N thin films as Metal bipolar plate for unitized regenerative fuel cell. Thin Solid Films, 544, 162-169. 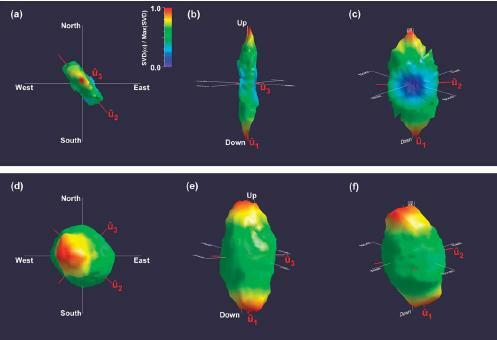 Macente, A., Fusseis, F., Menegon, L., Xiao, X., and John, T. (2017) The strain‐dependent spatial evolution of garnet in a high‐P ductile shear zone from the Western Gneiss Region (Norway): a synchrotron X‐ray microtomography study. Journal of Metamorphic Geology, 35, 565-583. Maga, M., Kappelman, J., Ryan, T.M., and Ketcham, R.A. (2006) Preliminary observations on the calcaneal trabecular microarchitecture of extant large-bodied hominoids. American Journal of Physical Anthropology, 129, 410-417. Matarazzo, S.A. (2015) Trabecular architecture of the manual elements reflects locomotor patterns in primates. PLoS ONE, 10, e0120436. Matarazzo, S. A. (2013) Knuckle-walking signal in the manual phalanges and metacarpals of the great apes (Pan and Gorilla). University of Massachusetts Amherst. McLauchlin, A. R., Ghita, O., & Tubke, B. (2013) Detection of Contaminants in Poly (ethylene terephthalate)(PET) by Near Infrared Spectroscopy. Picking up good vibrations, 423. Niikura, K., Iyo, N., Higuchi, T., Nishio, T., Jinnai, H., Fujitani, N., & Ijiro, K. (2012) Gold nanoparticles coated with semi-fluorinated oligo (ethylene glycol) produce sub-100 nm nanoparticle vesicles without templates. Journal of the American Chemical Society, 134, 7632-7635. Pardini, L., Kaeffer, B., Trubuil, A., Bourreille, A., & Galmiche, J. P. (2005) Human intestinal circadian clock: expression of clock genes in colonocytes lining the crypt. Chronobiology international, 22, 951-961. Pardini, L., Trubuil, A., Kaeffer, B., Kervrann, C., Hoebeke, M., & Cherbut, C. (2002) 3-D analysis of biomarkers and investigation of temporal series by Quant3D, a Linux/UNIX software package. In 7th Internet World Congress for Biomedical Sciences. Inabis2002, Session Medical Informatics,14-20. Parsons, T., Ryan, T. M., Reeves, R. H., & Richtsmeier, J. T. (2007) Microstructure of trabecular bone in a mouse model for Down syndrome. The Anatomical Record, 290, 414-421. Philippe, J., Le Godec, Y., Mezouar, M., Berg, M., Bromiley, G., Bergame, F., Perrillat, J.P., Alvarez-Murga, M., Morand, M., Atwood, R. and King, A., (2016) Rotating tomography Paris–Edinburgh cell: a novel portable press for micro-tomographic 4-D imaging at extreme pressure/temperature/stress conditions. High Pressure Research, 36, 512-532. Ponzoni, P. (2013) Studio dell’orientamento delle fibre nelle linee di saldatura di una poliammide rinforzata con fibre corte di vetro. Pringle, D. J., Miner, J. E., Eicken, H., & Golden, K. M. (2009) Pore space percolation in sea ice single crystals. Journal of Geophysical Research: Oceans, 114. Putlitz, B., & Baumgartner, L. (2012) Applications of µCT in metamorphic and igneous petrology. Raichlen, D.A., Gordon, A.D., Foster, A.D., Webber, J.T., Sukhdeo, S.M., Scott, R.S., Gosman, J.H., and Ryan, T.M. (2015) An ontogenetic framework linking locomotion and trabecular bone architecture with applications for reconstructing hominin life history. Journal of Human Evolution, 81, 1-12. Ravalico, C., & Cosmi, F. (2015) Evaluation of Fibre Length Distribution in a Short Glass Fibre Reinforced PA-6. Materiálové Inzinierstvo, 22, 140. Ravilico, C., and Francesca, C. (2015) Evaluation of fibre length distribution in a short glass fibre reinforced PA-6. Materiálové Inzinierstvo, 22.3, 140-147. Rowe, T. B., Luo, Z. X., Ketcham, R. A., Maisano, J. A., & Colbert, M. W. (2016) X-ray computed tomography datasets for forensic analysis of vertebrate fossils. Scientific data, 3, 160040. Russo, G.A. (2016) Comparative sacral morphology and the reconstructed tail lengths of five extinct primates: Proconsul heseloni, Epipliopithecus vindobonensis, Archaeolemur edwardsi, Megalapadis grandidieri, and Palaeopropithecus kelyus. Journal of Human Evolution, 90, 135-162. Russo, G.A. (In press) Trabecular bone structural variation in the proximal sacrum among primates. The Anatomical Record. Ryan, T.M., Colbert, M., Ketcham, R.A., and Vinyard, C.J. (2009) Trabecular bone structure in the mandibular condyles of gouging and nongouging platyrrhine primates. American Journal of Physical Anthropology, 141, 583-593. Ryan, T.M., and Ketcham, R.A. (2005) Angular orientation of trabecular bone in the femoral head and its relationship to hip joint loads in leaping primates. Journal of Morphology, 265, 249-263. Ryan, T. M., & Krovitz, G. E. (2006) Trabecular bone ontogeny in the human proximal femur. Journal of human evolution, 51, 591-602. Ryan, T. M., & Milner, G. R. (2006) Osteological applications of high-resolution computed tomography: a prehistoric arrow injury. Journal of Archaeological Science, 33, 871-879. Ryan, T.M., and Walker, A. (2010) Trabecular bone structure in the humeral and femoral heads of anthropoid primates. The Anatomical Record, 293, 719-729. Schöpa, A., Floess, D., de Saint Blanquat, M., Annen, C., Launeau, P. (2015) The relation between magnetite and silicate fabric in granitoids of the Adamello Batholith. Tectonophysics, 642, 1-15. Scozzese, S., Cosmi, F., & Bernasconi, A. (2010) Analysis of short glass fibre orientation in samples from a PA6. 6 GF35 car clutch pedal. In Youth Symposium on Experimental Solid Mechanics. Shanblatt, E.R., Porter, C.L., Gardner, D.F., Mancini, G.F., Karl Jr, R.M., Tanksalvala, M.D., Bevis, C.S., Vartanian, V.H., Kapteyn, H.C., Adams, D.E. and Murnane, M.M., (2016) Quantitative Chemically Specific Coherent Diffractive Imaging of Reactions at Buried Interfaces with Few Nanometer Precision. Nano letters, 16, 5444-5450. Sinclair, K. D., Farnsworth, R. W., Pham, T. X., Knight, A. N., Bloebaum, R. D., & Skedros, J. G. (2013) The artiodactyl calcaneus as a potential ‘control bone’cautions against simple interpretations of trabecular bone adaptation in the anthropoid femoral neck. Journal of human evolution, 64, 366-379. Skedros, J.G., Knight, A.N., Farnsworth, R.W., and Bloebaum, R.D. (2012) Do regional modifications in tissue mineral content and microscopic mineralization heterogeneity adapt trabecular bone tracts for habitual bending? Analysis in the context of trabecular architecture of deer calcanei. Journal of Anatomy, 220, 242-255. Srivastava, P.K., Chandel, C., Mahajan, P., and Pankaj, P. (2016) Prediction of anisotropic elastic properties of snow from its microstructure. Cold Regions Science and Technology, 125, 85-100. Su, A., & Carlson, K. J. (2017) Comparative analysis of trabecular bone structure and orientation in South African hominin tali. Journal of Human Evolution, 106, 1-18. Su, A., Wallace, I. J., & Nakatsukasa, M. (2013) Trabecular bone anisotropy and orientation in an Early Pleistocene hominin talus from East Turkana, Kenya. Journal of human evolution, 64, 667-677. Thissen, C. J., & Brandon, M. T. (2015) An autocorrelation method for three-dimensional strain analysis. Journal of Structural Geology, 81, 135-154. Tsuda, H., Mori, S., Halbig, M. C., & Singh, M. (2012) TEM observation of the Ti interlayer between SiC substrates during diffusion bonding. Tsuda, H., Mori, S., Halbig, M. C., Singh, M., & Asthana, R. (2015) Diffusion Bonding and Interfacial Characterization of Sintered Fiber Bonded Silicon Carbide Ceramics Using Boron‐molybdenum Interlayers. In Advanced Processing and Manufacturing Technologies for Nanostructured and Multifunctional Materials: A Collection of Papers Presented at the 38th International Conference on Advanced Ceramics and Composites January 27-31, 2014 Daytona Beach, Florida, 73-80. Tsuda, H., Mori, S., Halbig, M. C., Singh, M., & Asthana, R. (2015) Microstructural Observation of Interfaces in Diffusion Bonded Silicon Carbide Ceramics by Tem. Advanced Processing and Manufacturing Technologies for Nanostructured and Multifunctional Materials II: Ceramic Engineering and Science Proceedings, Volume 36, 12. Tsuda, H., Mori, S., Halbig, M. C., Singh, M., & Asthana, R. (2014) Transmission Electron Microscopy of Interfaces in Diffusion-Bonded Silicon Carbide Ceramics. In Advances in Science and Technology, 88, 139-147. Wang, Y., Lesher, C., Fiquet, G., Rivers, M.L., Nishiyama, N., Siebert, J., Roberts, J., Morard, G., Gaudio, S., Clark, A. and Watson, H., (2011) In situ high-pressure and high-temperature X-ray microtomographic imaging during large deformation: A new technique for studying mechanical behavior of multiphase composites. Geosphere, 7, 40-53. Wang, Q., Smith, A.L., Strait, D.S., Wright, B.W., Richmond, B.G., Grosse, I.R., Byron, C.D., and Zapata, U. (2010) The global impact of sutures assessed in a finite element model of a macaque cranium. The Anatomical Record, 293, 1477-1491. Wolf, D., Rodriguez, L.A., Béché, A., Javon, E., Serrano, L., Magen, C., Gatel, C., Lubk, A., Lichte, H., Bals, S. and Van Tendeloo, G., (2015) 3D magnetic induction maps of nanoscale materials revealed by electron holographic tomography. Chemistry of Materials, 27, 6771-6778. Yu, X.-L., Fu, Y.-N., Brookes, P.C., and Lu, S.-G. (2015) Insights into the formation process and environmental fingerprints of iron-manganese nodules in subtropical soils of China. Soil Science Society of America Journal, 79, 1101-1114. Zandomeneghi, D., Voltolini, M., Mancini, L., Brun, F., Dreossi, D., & Polacci, M. (2010) Quantitative analysis of X-ray microtomography images of geomaterials: Application to volcanic rocks. Geosphere, 6, 793-804. Zeininger, A., Patel, B.A., Zipfel, B., and Carlson, K.J. (2016) Trabecular architecture in the StW 352 fossil hominin calcaneus. Journal of Human Evolution, 97, 145-158.